Watermelon juice is a amazing thirst quencher and i have posted few combo of watermelon juice in Jeyashris kitchen. 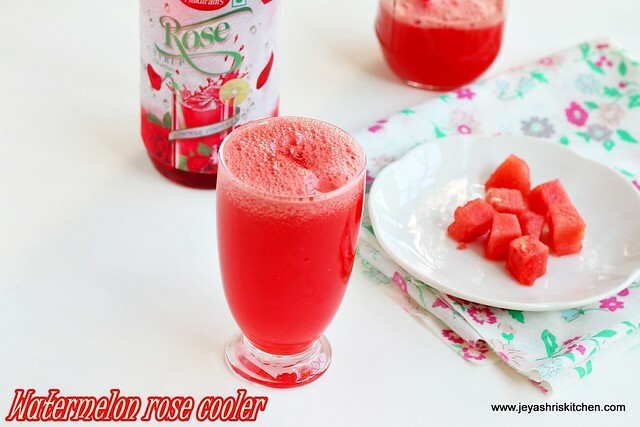 This watermelon rose cooler, the mix of watermelon and roohafza(rose essence) is yet another way of making watermelon juice. I always have fruits as it is and rarely make juice out of them. As my daughter is having study holidays, made this for her yesterday as it was too humid and hot in the afternoon. I saw this idea of watermelon and rose essence in instagram long back. Enjoy this drink on a sunny day. In a mixie or blender add the watermelon cubes and the rose syrup. Generally the essence has sugar but if you do not sugar in the syrup or if you are using the rose milk powder, add sugar to this now. Add according to your taste and the sweetness of the watermelon. You can add honey also. Add water and mix well. Serve chilled. Instead of water you can add ice cubes to this and can serve immediately. You can add 1 tblsp of soaked sabja seeds to this to make it more healthy. You can few frozen bits of watermelon cubes to the juice just before serving.